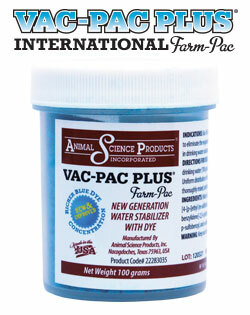 Vac-Pac Plus® International Farm-Pac is a concentrated dry powder stabilizer with added color crystals. 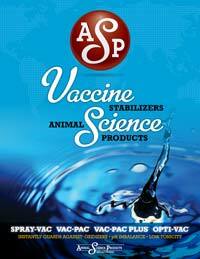 It stabilizes vaccines administered via drinking water and includes a dark blue dye. 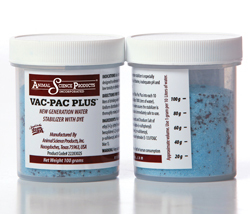 Farm-Pac works faster and is safer for vaccines than effervescent tablets or milk products. It does not contain any products of animal origin. Each jar contains 100 grams and stabilizes 1000 liters. The convenient re-sealing jar is marked with graduations to make it easier to measure when less than a full 100 grams are needed. 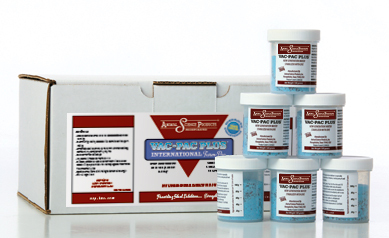 Blue dye provides visual assurance that the stabilizer has been added and is properly mixed. It marks the progress of the water as it fills the drinking line.